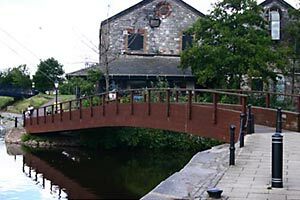 This small wooden bridge was installed to cross the outlet of the Higher Leat where it enters the Exe by the Custom House . It was built in 1984 and completed the path to Shilhay giving access to the new Cricklepit Suspension Bridge and the bank of the Exe at Shilhay. The designer was D J Howard of Exeter City Council. Exonian, Harold Vincent Mallison, was a professor who left his money to the city. He died in 1980 with a request that this bridge be constructed. He was a formidable chess player between the wars and was the first Exeter player to win the Thomas Winter Wood Trophy, the Devon championship. The bridge was opened by his nephew R L Mallison on 19th September 1984. 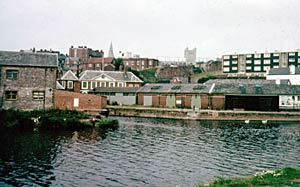 Before the bridge was constructed, the bank on the other side of the leat did not exist, as Coney Lake, the cutting that formed the island of Shilhay emerged next to the grey warehouse. The arched stone bridge further up the leat between Commercial Road and the Quay, by the Custom House, was built in 1681. Mallison footbridge. The outlet of the leat before the Mallison Bridge was constructed.